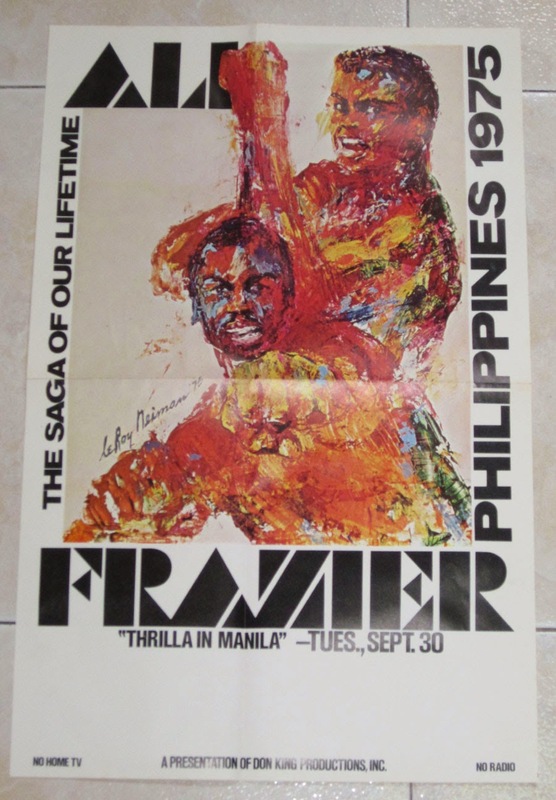 On October 1, 2015 we will be celebrating the 40th anniversary of "THRILLA IN MANILA" which is considered by boxing fans as the greatest fight of Muhammad Ali's career. 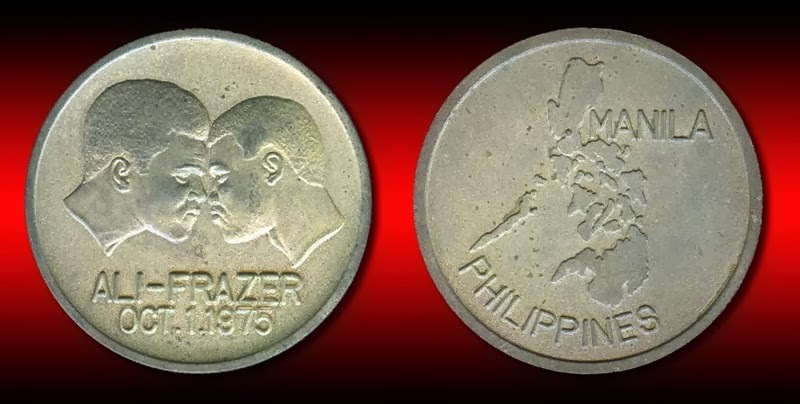 The contest's name is derived from the frequent rhyming boast made by Ali that the fight would be a "Killa and a Thrilla and a Chilla, when I get that gorilla in Manila". 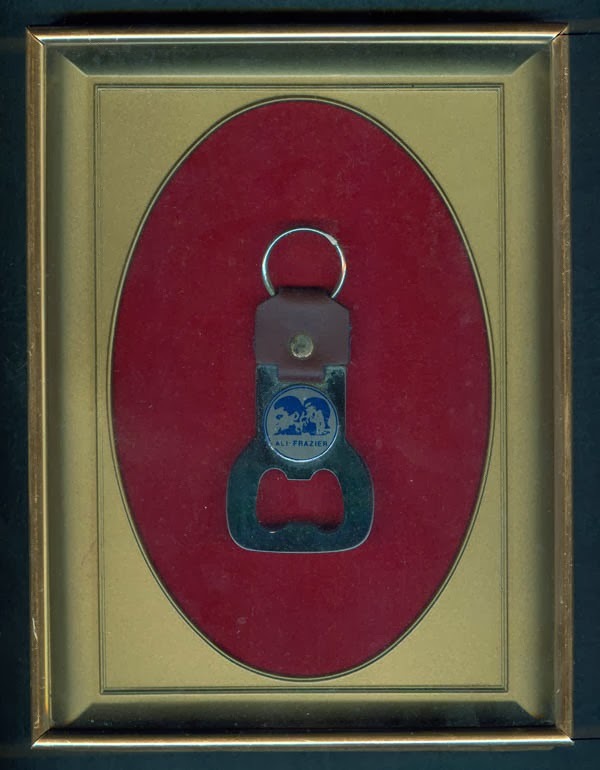 Many souvenir items were made to promote the fight and enterprising individuals made a killing selling these items. 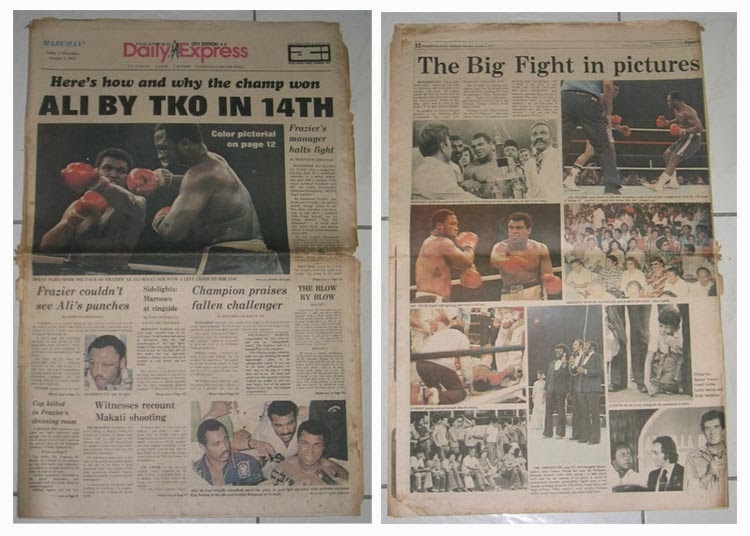 To commemorate this great event, I am sharing you some of the memorabilia that came out during the fight. 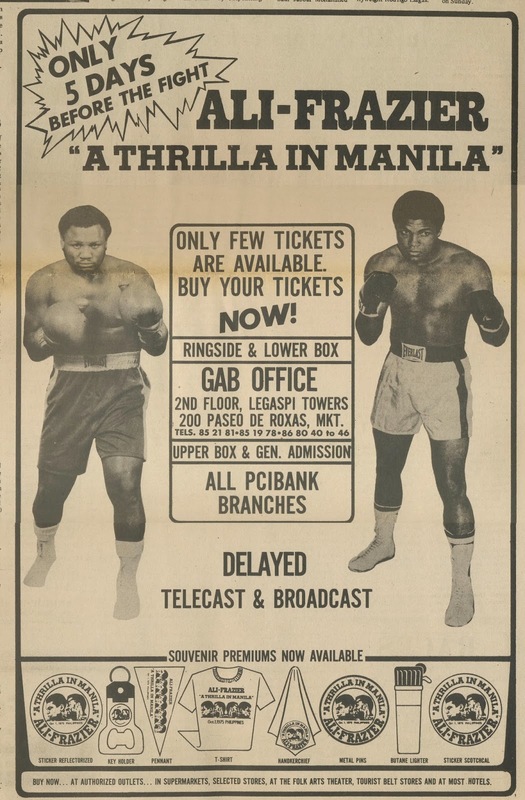 Promoted by Don King, the Thrilla in Manila had a tremendous media following. 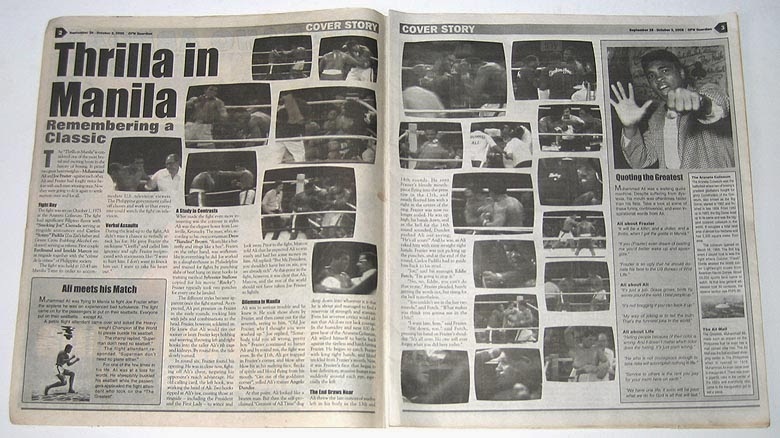 The fight was shown on closed-circuit television in 380 locations in the United States and broadcast to 68 countries worldwide. 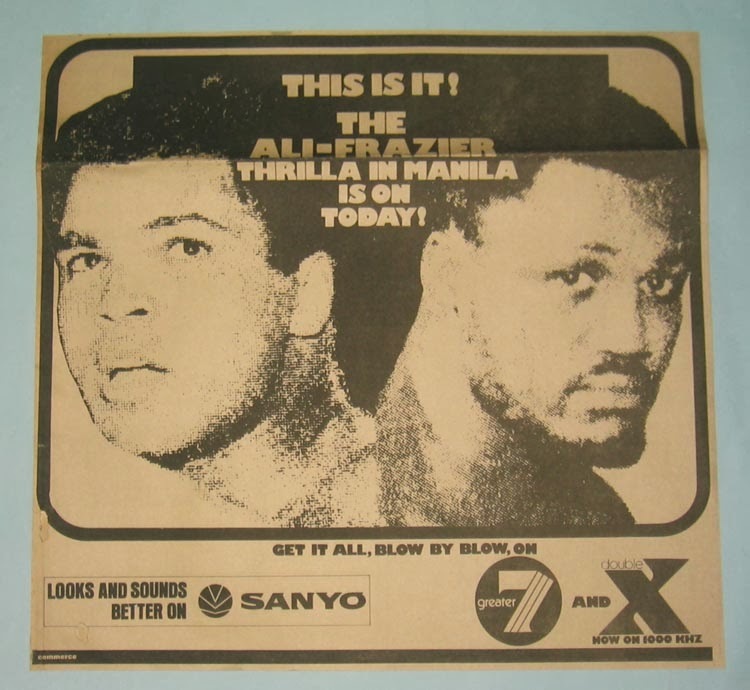 Ali was guaranteed $4.5 million against 43% of the gross, while Frazier was guaranteed $2 million against 22%. 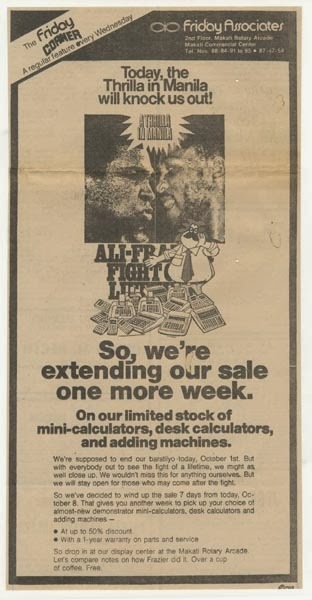 Ali ended up with about $9 million and Frazier made roughly $5 million. 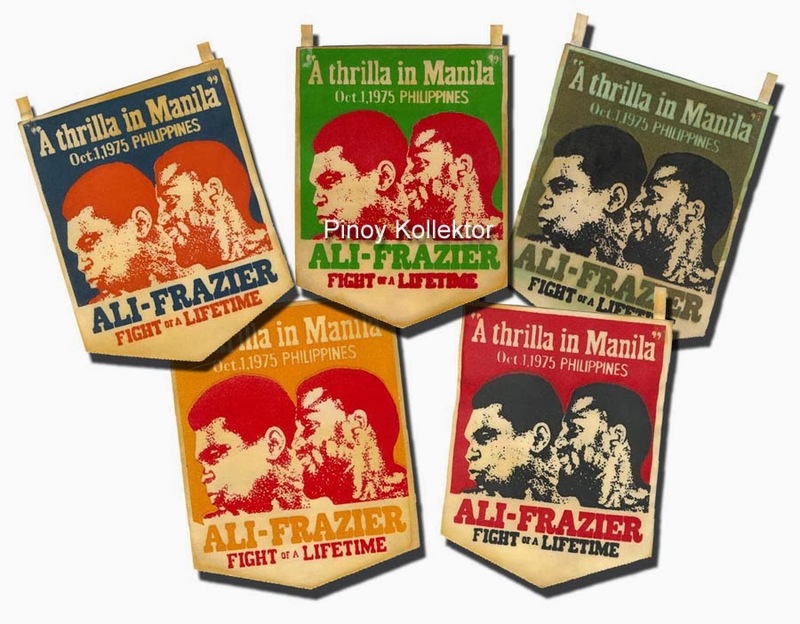 Felt pennant / banners in 6 colors - blue, apple green, moss green, yellow orange, red and dark green (not shown), were made to promote the fight. The mood of the two fighters and their camps could not be further apart. 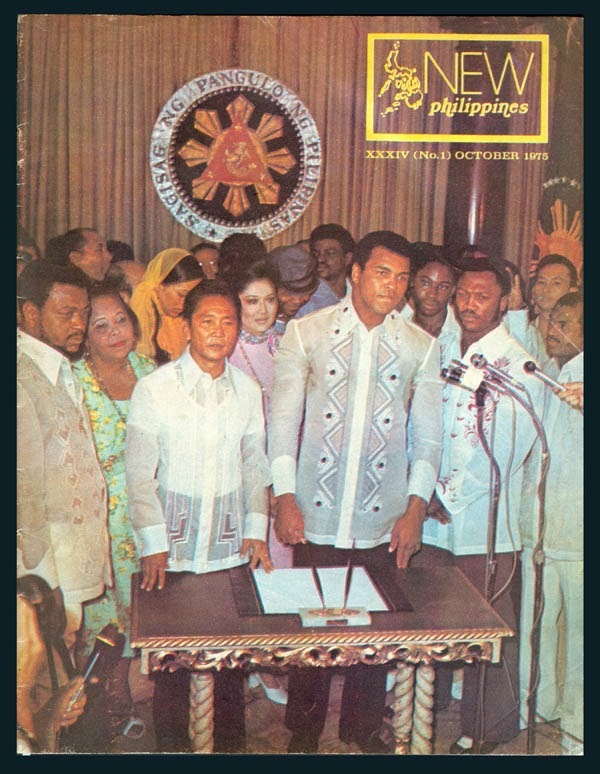 In Ali's camp, the mood was jovial and lighthearted. 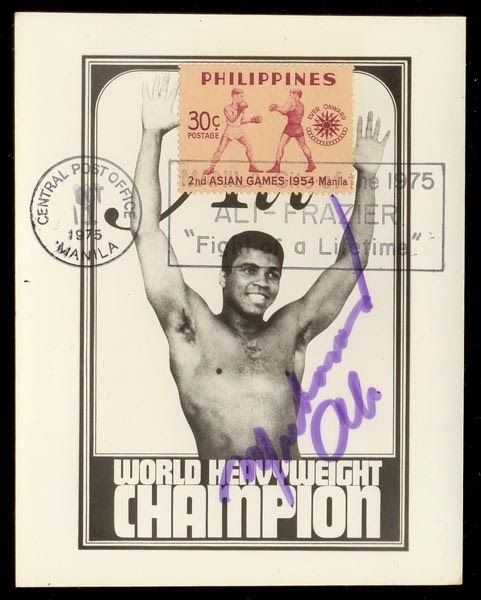 According to Ali's longtime physician and cornerman Ferdie Pacheco, it was believed by Ali and his trainers that Frazier was washed up after his devastating loss to George Foreman and the relative ease with which Ali had defeated Frazier in their rematch. 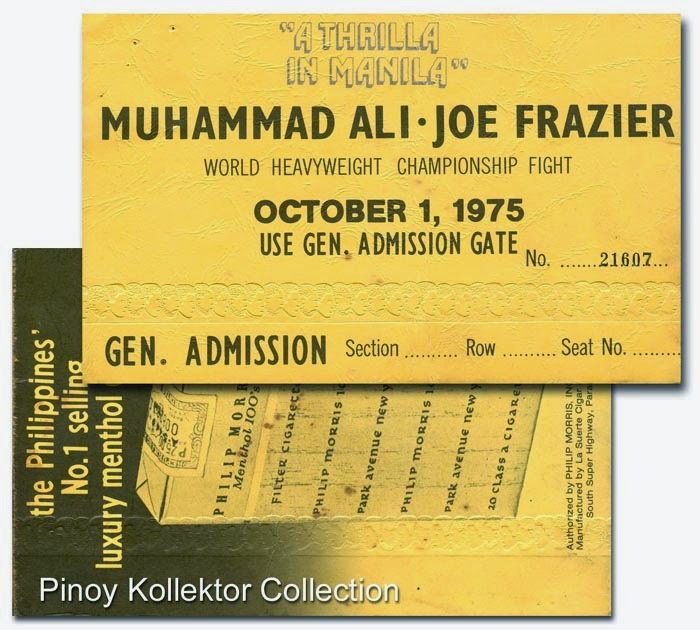 The general consensus was that Ali was doing Frazier a favor, giving Joe one last big payday before sending him off into retirement. As a result, Ali did little training, instead concentrating on the torrid affair he was having with Veronica Porche and amusing the vast entourage that had come to be nicknamed the "Ali Circus". 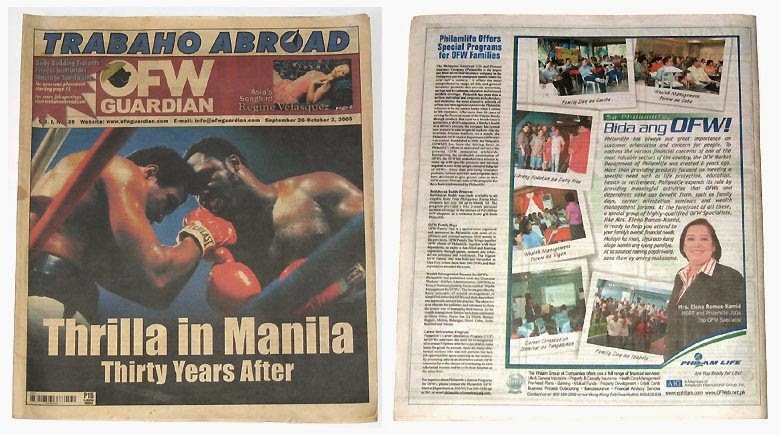 Later, when Ali's wife Belinda found out that Ali was not only carrying on this affair but was introducing Veronica as his wife, she flew to the Philippines and confronted Ali, causing yet another distraction. Frazier, meanwhile, was training with a grim and determined intensity. 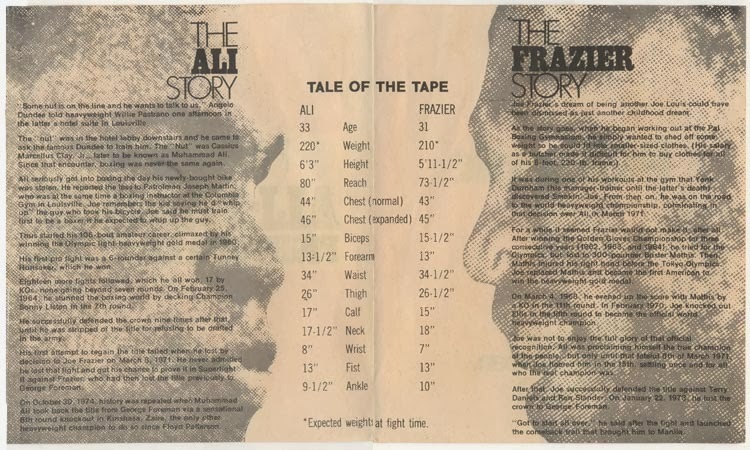 Frazier had a bitter hatred for Ali. He had never forgiven Ali for the spew of invective Ali had directed at him after they signed to fight each other in 1971. 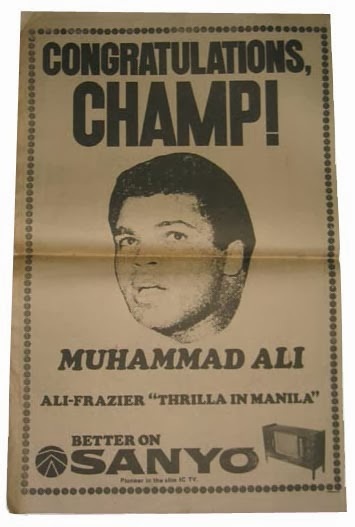 Ali labeled Frazier as an "Uncle Tom" and as the "White Man's Champion." Ali also labeled Frazier as an "ugly dumb gorilla", deriding him as an inarticulate physical specimen devoid of any intelligence. 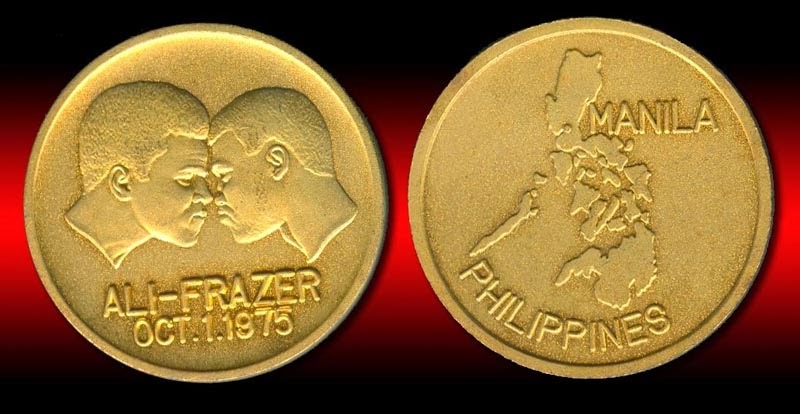 Ali famously punched a rubber gorilla meant to represent Frazier during a press conference while saying "It's gonna be a chilla, and a killa, and a thrilla, when I get the Gorilla in Manila." MARLBORO Cigarette advertisement at the back. The "Uncle Tom" and "White Man's Champion" remarks infuriated Frazier, who Ferdie Pacheco described as "nothing but raging black." 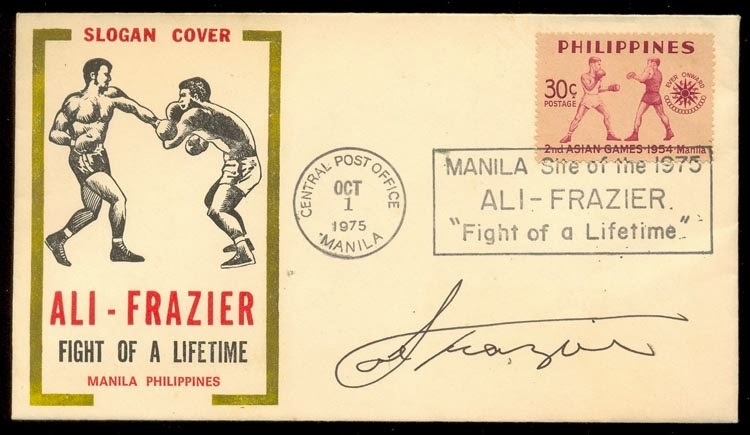 Frazier was the son of a sharecropper from the deep South and a survivor of ghettos in New York and Philadelphia, to which he moved as a minor by himself to pursue boxing. He had certainly suffered prejudice and discrimination that Ali had never known. 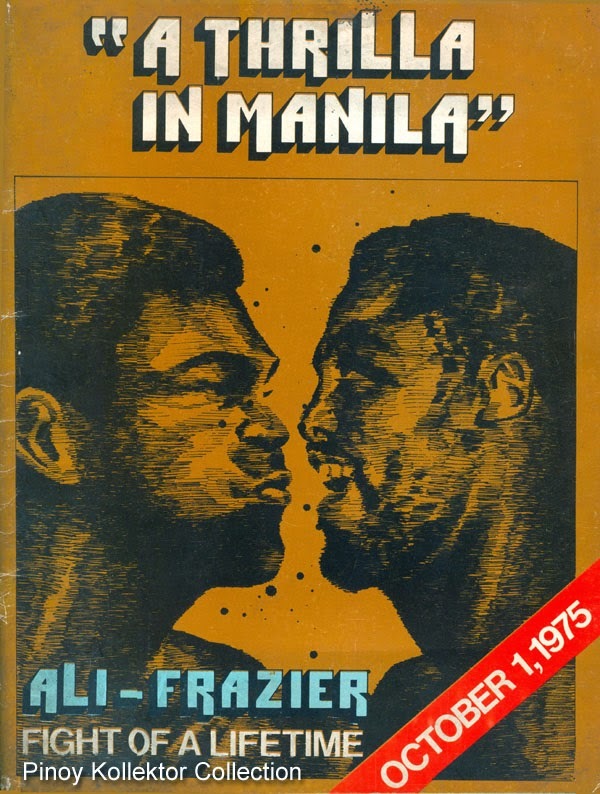 Furthermore, Frazier felt that Ali had betrayed him because Frazier had ardently supported Ali throughout his difficulties stemming from his refusal to enter the U.S. Army. 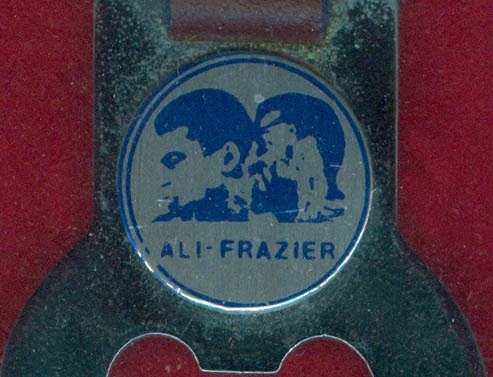 Frazier supported Ali's attempt to have his boxing license restored and helped him financially during his exile from boxing, periodically giving Ali hundreds of dollars. 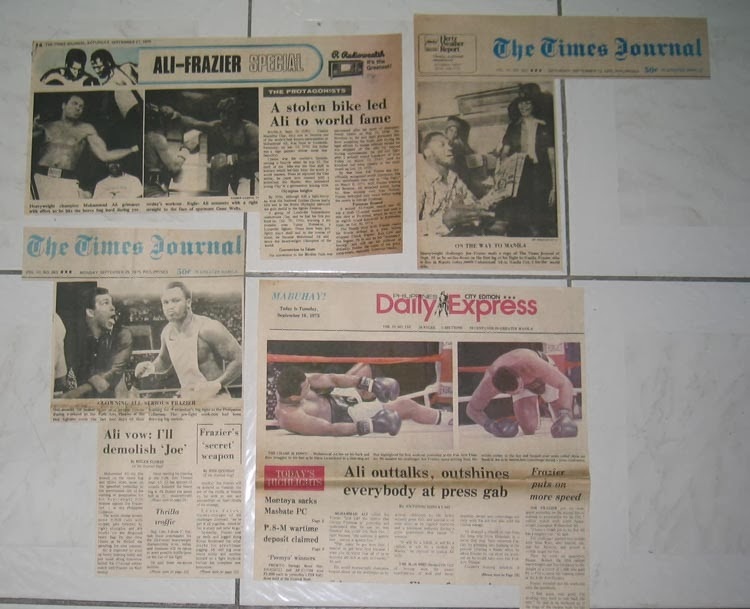 The ad hominem attacks that Ali directed at Frazier were unforgivable according to Frazier. 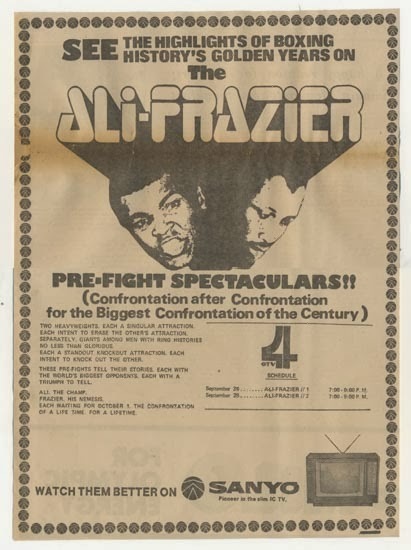 While Ali has since asserted that he did so in an attempt to promote their fights and increase the gate, Frazier always countered that it wasn't necessary because their purses were guaranteed. 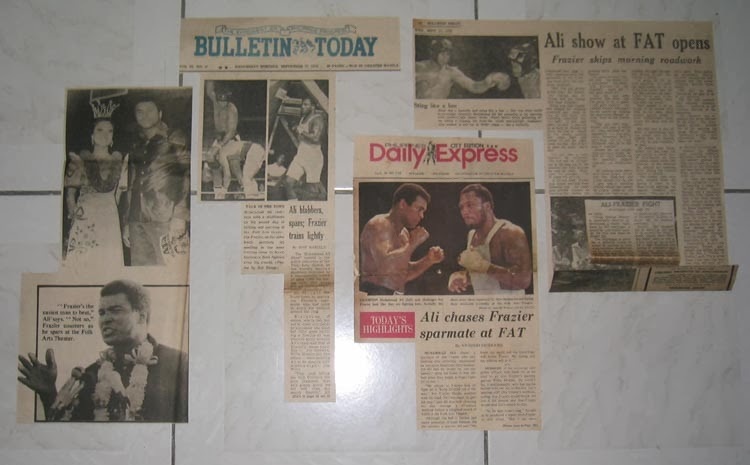 Frazier and Ali's relationship and the lasting enmity that Frazier harbored for many years stems from this period of time. PHILIP MORRIS Cigarette advertisement at the back. At 10:45 a.m. on October 1, 1975, the bell for the 1st round rang. Ali had previously told his trainers that he was going to "put a whuppin'" on Joe Frazier, and he started the fight looking to do just that. Frazier was known for starting fights slowly, and Ali came out looking to use that to his advantage. Rather than dance and use his speed to stay away from Frazier, Ali came out and walked flat-footed to the center of the ring and proceeded to unleash a flurry of combinations on Frazier. However, to the amazement of Ali and many watching, Frazier continued to come forward, intent on punishing Ali's body at close range, despite having to take more and more of the withering punishment Ali was dishing out in order to do so. As Ali began to tire, Frazier turned up his own offense and began punishing Ali to the body and the head with his trademark hooks. By the sixth round, Frazier had staggered him in turn and seemed to be gaining control of the bout. At the beginning of the seventh round, Ali reportedly whispered in Frazier's ear, "Joe, they told me you was all washed up." Frazier growled back, "They lied." 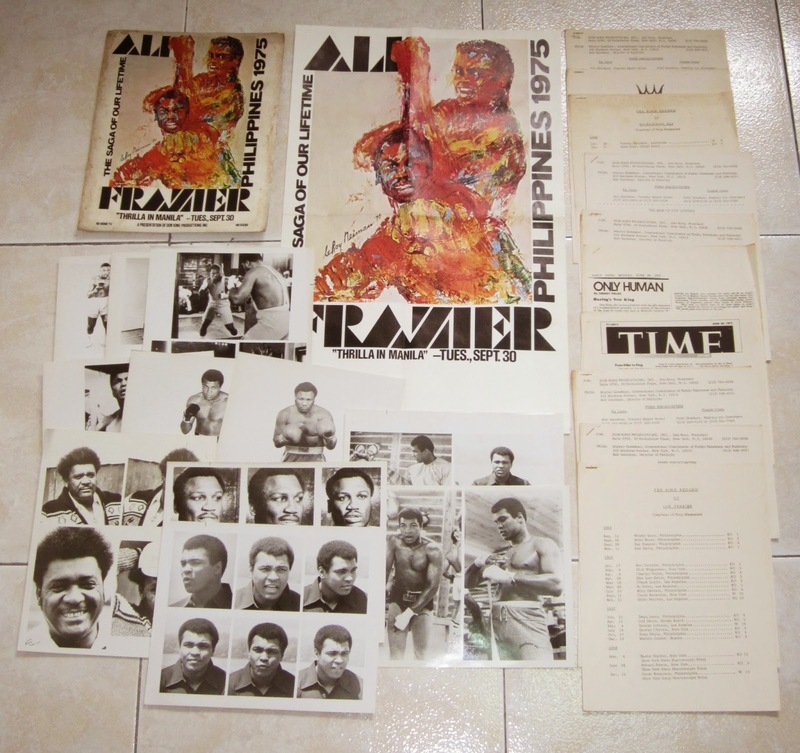 Ali-Fraizer POSTER & PRESS PROMO KIT of the THRILLA IN MANILA. 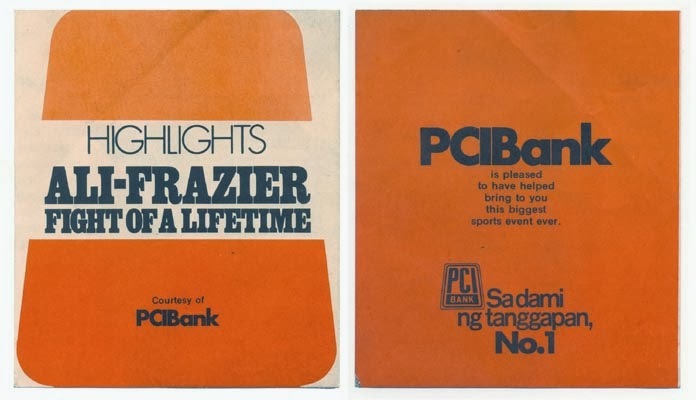 Frazier dominated the middle rounds. 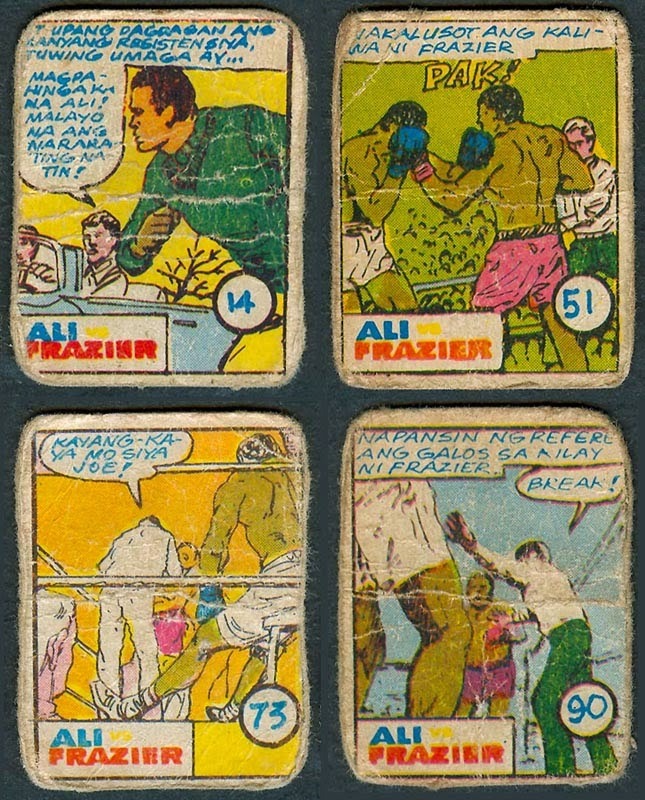 Ali tried to fend Frazier off with occasional flurries and spurts of manic activity. He even unsuccessfully tried to use the rope-a-dope technique that had defeated George Foreman nearly a year earlier, but it was all negated by Frazier's relentless assault and power. Between the terrific heat inside the stadium, Frazier's assault, and his own nonchalant training, it began to seem that Ali would wilt. Finally, in the tenth round, Frazier began to slow down and tire, and Ali slowly turned the tide. In the 11th round, he used his speed to dance more and to unload a series of fast combinations on Frazier, which severely disfigured his face by the end of the round, swelling Frazier's eyes to the point that nothing but a tiny slit remained open. 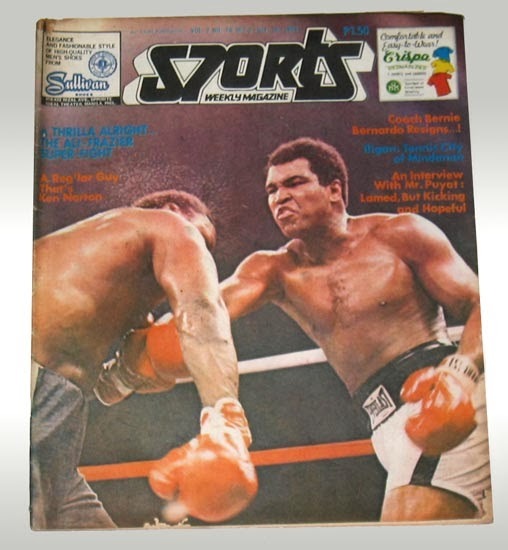 Throughout the 12th round, Ali continued to turn the momentum, increasingly overwhelming Frazier and using the fact that Frazier could no longer see his right hand coming to hit Frazier with one hard right after another. 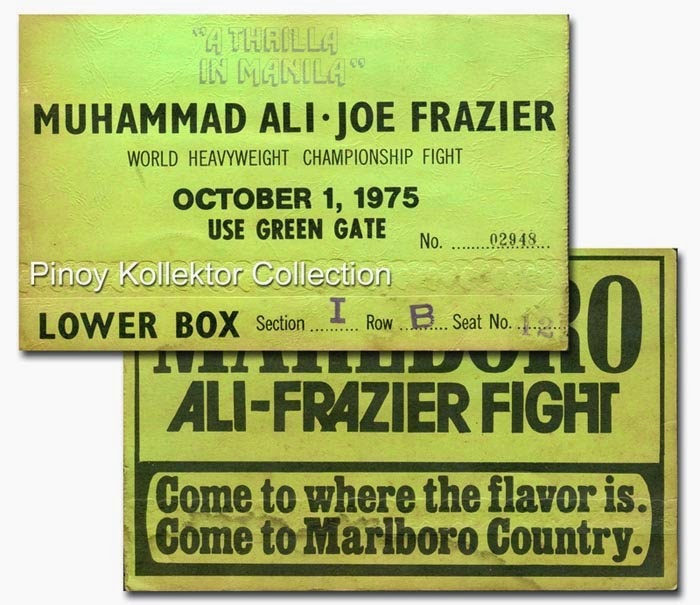 About a minute into the 13th round, Ali landed another blistering combination on Frazier, sending the injured fighter's mouthpiece flying into the crowd. Eddie Futch, Frazier's trainer, decided to stop the fight between the 14th and 15th rounds. Frazier protested stopping the fight, shouting "I want him, boss" and trying to get Futch to change his mind. Futch simply replied, "It's all over. No one will forget what you did here today" and signaled to the referee to end the bout. At the post-fight press conference, Ali said, "Joe Frazier, I'll tell the world right now, brings out the best in me. I'm gonna tell ya, that's one helluva man, and God bless him." He then announced, "Joe Frazier is the greatest fighter in the world, next to me." Children's teks card sold in sari-sari stores. 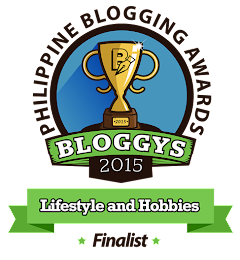 These are rare items because they are well loved and well - played by kids. R.M. 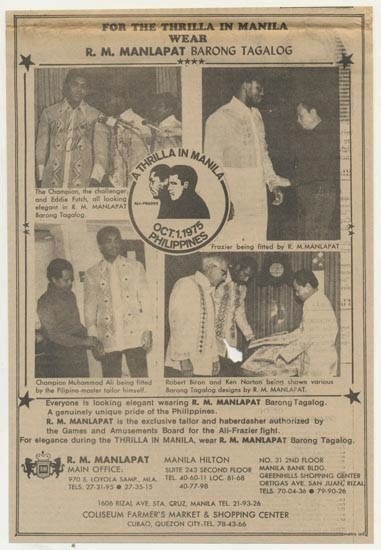 MANLAPAT Barong Tagalog advertisement For the Thrilla in Manila wear.